I’ve jut finished up a ton of pieces for the show I have up at the Flightpath. I’m sharing the space for the month with Logan Cooper of Boots in the Oven and Andy Sams, both are exhibiting photography pieces. The show will be up until September 1st. I’ve been picking up vintage handkerchiefs for the last several years whenever I come across them an thrift stores. 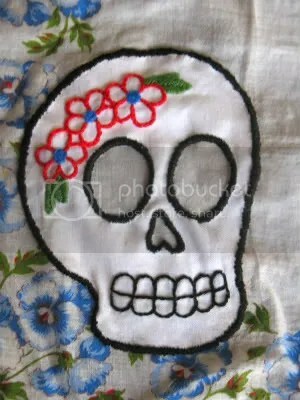 I took a few and attached some hand embroidered sugar skull appliques I had made foe each individual piece. 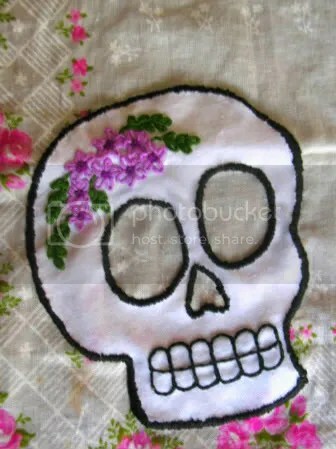 I struggles endlessly with attaching the appliques as the hankie Fabric is not only thin but incredibly delicate due to age. I ended up ruining one…my favorite one…it was very sad. So if you get chance, swing by the Flightpath and check out our show. Content and images ©2008-2011 Jennifer Andrews all rights reserved.